It turns out that there were times in real life when Oliver Hardy felt like giving Stan Laurel a good smack, and vice versa. Those are the juicy bits in the BBC-produced biopic “Stan & Ollie,” an unexpected portrait of the legendary comedy duo on a mostly forgotten stage tour at the twilight of their careers. The whimsically reverent film could do with more of this sort of dishing, given how absorbing it is to watch the two get into it over long-suppressed issues in their partnership. But Steve Coogan and John C. Reilly do such phenomenal, studied work in donning the bowlers of Laurel and Hardy — is a “respectively” really needed? — this one is worthwhile viewing, no matter how lightly it might tread. Reilly, in fact, won the 2018 Boston Society of Film Critics’ award for best actor. The movie does offer a glimpse of the pair at their height, opening on them strolling across the Hollywood lot of comedy mogul Hal Roach, at once skillfully and effortlessly slipping into character to charm the studio rank and file. But earnestly industrious Laurel, in particular, isn’t entirely content: He feels that hardball-playing Roach (underutilized Danny Huston) ought to be treating them more like Chaplin. Eager-to-please Hardy agrees — until Roach pushes back, hard, resulting in a trial creative separation for the team. Who knew — or remembered, at least? Fast forward a decade and a half, and the pair have gotten into another nice mess, indeed. Kudos to detail-oriented director Jon S. Baird (“Filth”) and writer Jeff Pope for dropping in Hardy’s catchphrase correctly; “fine mess” is actually a misquote. Laurel has arranged for them to do a British variety-show tour to pave the way for a comeback film, but their booking agent (Rufus Jones) is all worrisome double talk, they can’t get Hollywood on the phone, and Hardy’s health is failing. Still, the show goes on, in thoroughly entertaining style — never mind whether it’s ’53, ’37, or 2019, for that matter. 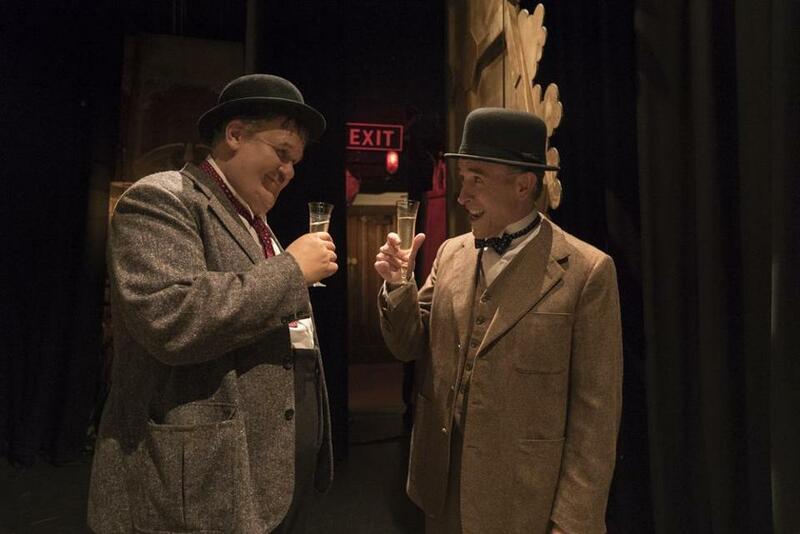 Coogan and Reilly expertly capture everything from their subjects’ slapstick timing to their interplay behind the scenes, with veteran impressionist Coogan especially disappearing into his role, seemingly just by the way he holds his mouth. The sentiment and pathos we’re treated to are almost a bonus: Laurel and Hardy’s touching professional and personal dynamic, their familial fondness and resentments, the puzzlement and sadness Laurel feels in gazing at an Abbott and Costello poster as his own star is flickering out. Come to think of it, “exquisite mess” might be more like it. Directed by Jon S. Baird. Written by Jeff Pope. Starring Steve Coogan and John C. Reilly. At Kendall Square, West Newton, Dedham Community. 97 minutes. PG (some language, smoking).